Adding a new pet to your family is a big decision. Pets bring balance, love, and an escape of sorts from our everyday stresses. Pets also bring us together and manage to teach us an awful lot. All dogs were originally bred for certain behaviors, (herding dogs herd, sight hounds run fast, etc) so do your research and make sure the breed of dog you are interested in has an activity level that will fit into your lifestyle. 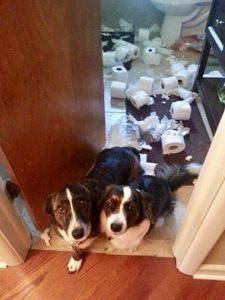 Dogs are not predisposed to behavior problems. 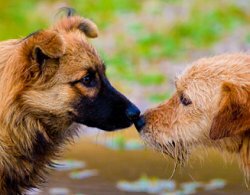 Most behavior problems are due to inconsistent or lack of training from the beginning, and behavior problems are the most common reason dogs are left at pounds. Puppies (and dogs) are not really that hard to manage if you remind yourself that you are dealing with the mind of a 2 year old and that training is a logical, progressive process that anyone can master with a little patience, humor, some high value treats and a lot of love. Spend the time when your dog is new and you will soon have a loving, well behaved member of your family. Rule #1 Crate Train your dog. Dogs are not spiteful. Dogs live in the moment. Chewing up your shoes or shredding the garbage was not done in spite because you left him home alone. Remember that 2 year old? Well he has got one powerful nose and if the garbage is accessible and something good and smelly was left inside, he is going to want to investigate. If you leave your new dog loose in your house, there is no telling what sort of mischief he may get into. A large new place, like your home, can be a bit overwhelming and even scary for a new dog to be left unattended in. Crate Training does not mean that your dog should / or will live the rest of his life in a crate. What it does mean, if done correctly, (lots of high value treats) is your dog will have a place where he can be feel safe and secure until he is mature and confident enough to handle a larger space unattended. Giving your dog a place that he can call his own also can help suppress separation anxiety, and speed along house breaking. Click here to learn more on how to crate train your dog. So your new pup wants to play, but your schedule is keeping you busy and the pup at your feet is getting in your way. This is a good time to redirect your pups attention to something that will entertain him, but allow you to get your tasks done. The easiest thing to redirect to is a chew toy. I use nylabones for this purpose, as they are safe (they don’t cause guarding in my multi-dog household) clean and easy. You may need to spend a few minutes interacting with him with the bone.. maybe toss it a few times, let him know how excited you are about this bone and how good it is to chew. You could also get an interactive toy that involves putting dog cookies or peanut butter inside and let him play with that for a while. 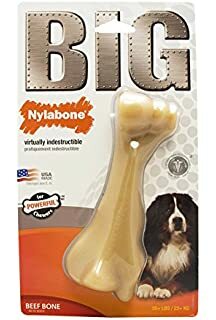 Nylabones do seem drab and unexciting to some dog owners compared to other chew toys that are now on the market, but, they are much safer and healthier then processed rawhide or animal parts, and will last a lot longer. Read more about the best chews for your pup here. Everyone wants the perfect dog. One that will be friendly with visitors, yet bark at danger. A dog that will hang with the kids, and be ready to go for a jog. Your perfect dog is within your reach, but it is up to you to mold that “2 year old” into the solid citizen that he needs to become. Socializing your new pup allows him to meet other humans and dogs in new and exciting places. But the biggest benefit to taking your dog out to new places is the “bonding effect”. Your new dog is going through a lot of new experiences, hopefully by this time, he has learned that YOU are “nice”. He knows you feed him, you let him out, give him cookies, love him and you talk nice to him. When you are at a new place, You are his comfort, his trust and his safety. By taking him out into the world you have given him a big adventure with his new best friend. The more adventures you have together, the more confidence he will gain in himself and the more trust he will gain in you. Not sure where you can take him in your town? Look for farmers markets, dog friendly festivals, and outdoor supply stores. Make sure you are loaded with his favorite high value treats, and his favorite toy. And Please don’t forget to bring your common sense. Make sure your dog has a properly fitted collar (combo collars are good for new dogs) or harness, with proper ID on it, be prepared to clean up after your dog, and remember that not all dogs that you meet will be friendly, so ask the handler before you let your dog run up to any unknown dogs. As a perpetual 2 year old your dog is going to have a limited vocabulary, and even though dogs are champions at reading body language and tone, it is important to have consistent verbals when training. You do not have to use the words that everyone else uses, and you can certainly make your own words for communicating with your dog. For example, I use “This Way” while free walking my dogs on their daily walk, it keeps them with me without feeling that they have to be beside me. Your dog should be exposed to different sorts of toys. Things to Chew, Things to fetch and Things to tug, shake and share. As he grows you will learn what toys are best for him and what toys he responds to. Eventually, you will notice that he may favor a certain toy, Maybe he really loves to fetch a ball, maybe its a frisbee, perhaps he Loves a game of tug with you. This favorite toy can also work for you as a motivational aid. This favorite toy may eventually be substituted instead of treats, and can be used as a reward for training tricks, dog sports, or any thing that you may need to teach your dog for his own safety. Be observant, and notice what toys really excite your dog. 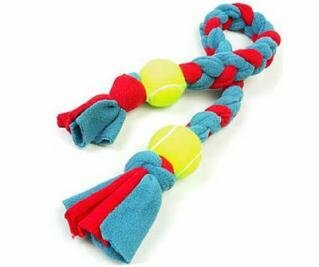 Take that toy with you on outings and use it when you need to get your dogs focus back on you or just to help him relax. New dogs and puppies do not happen very often in our lives, and this new relationship should be looked upon as the special new beginning that it is. Have fun with your dog daily. Smile and laugh at the silly things that your dog does. He will love you with all his heart and You should love him back. Get help if you need it and if you really want to explore all that a new dog has to offer, take him to classes. There you will find others exploring relationships with their dogs, new friends and new dog friends. I hope I have offered you some clues to make your new dog comfortable and your new position as caretaker enjoyable and full of positive fun. 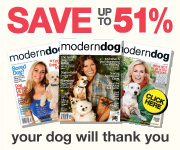 I Love talking dog and would love to hear about a special time in your relationship with your dog. Please leave me a comment. 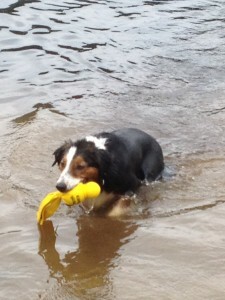 Mental and physical Fun for your Pup! I recently discovered this amazing interactive tug toy for my corgi Eddie. 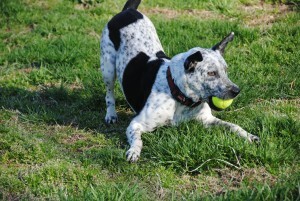 Eddie is a very active Cardigan Welsh Corgi that is constantly on the go and is always ready to retrieve a ball. Recently, Eddie pulled the sheath off of one of his toe nails and running and ball playing were not allowed.. and although he has been healing up nicely, his technique of sliding into the retrieve, often caused him pain and more limping. 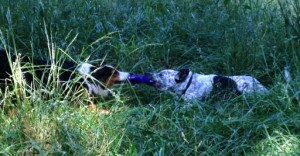 I bought the Tether Tug Dog Toy for one of my other dogs that is more into rope toys, never thinking that the corgis would enjoy it so much, but after a little bit of interacting with him and the rope, he caught on quickly and now it is one of his favorite things to play with in the yard. This Tether Tug toy is a great stress release for him as I have noticed when the dogs across the road are barking, instead of running to the fence to bark back, he runs to his “tugger” and starts pulling and shaking.. The amazing thing is that because of his stature, his front toes do not take any abuse, and his sensitive toe is just about all healed up, with the added benefit of keeping him fit (he is an agility dog) and strengthening his core at the same time. I can’t stress enough how much this has helped Eddie maintain his happy outlook, all the while, keeping him from painfully banging his toe and causing any further injury. INTRODUCTION: No matter what size dog you have, I would recommend you get the largest size you feel comfortable with. Mine is an XL and certainly a great choice for my corgis who are not XL.. Easy to install, using a large hammer, and, the pole lifts out for easy lawn maintenance. The XL is designed for all dogs over 60 pounds including Pit Bulls, and has a larger heaver duty base. This toy is great for any active, high energy dog or any dog that likes to play tug. Often times , both my corgis will pull at the same time, against each other and against the pole. 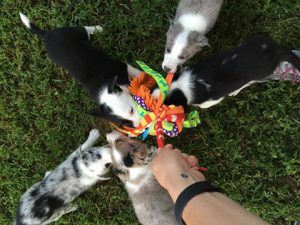 PRODUCT OVERVIEW; As with any dog toy that is played with roughly, the rope should be monitored for damage and can easily be replaced with tether tug replacements , or you can make your own tether tug replacement with fleece. RATING; 8 out of 10 . When installed correctly, this toy provides hours of entertainment for your dog(s). The one worry that I have about it is the “snap” that holds the rope toy to the pole. 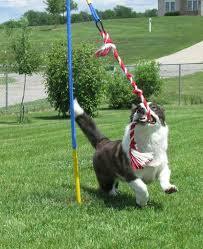 My taller dogs tend to reach higher toward the top of the rope and occasionally would mouth the snap. I wrapped it with a bit of duct tape, to prevent teeth from getting caught, and that solved that issue. FINAL OPINION: This is a great toy to add to any dog lovers arsenal of toy options for your dogs! Certainly can’t replace the time you spend with your dog, but can help burn off some excess energy and strengthen at the same time. 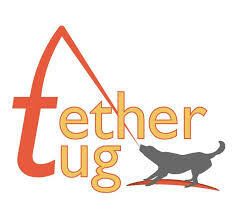 I would love to hear about your dogs adventures with their Tether tug.. Or have a question I can help with? Drop me a note… I LOVE to talk dog..! Dog toys are intended to enhance the life of you and your dogs, and each one of your dogs will have a different approach to each toy. In a Multi dog household it is sometimes difficult to keep toys around, so it is important to consider what kind of toys are good for each of your dogs and, to purchase toys that are durable, safe and of quality. You absolutely do not want to give toys that are worth fighting over. 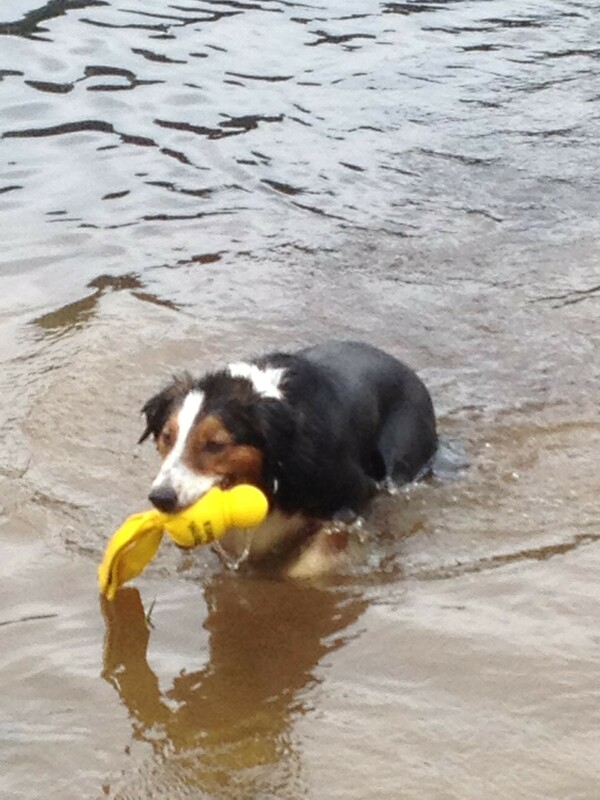 I Love Dog Toys that my dogs love! Having said that, I do not love some of the things that my dogs do with their toys, especially destroying them. Stuffed toys occasionally make their way into my home, only to be quickly un-stuffed and de-squeaked, but if the outside of the toy is made from a durable fabric, like canvas, and it is large enough, this toy can go on to become a fine outside toy that can be tugged, shaken, buried and drug around. And if I have a couple of old un-stuffed toys I can tie them together in a knot and maybe even put a squeaker back in. Always supervise when initially giving out new chew items. After a few days the new bones will loose their initial appeal and they will be available for general chewing.. Always provide more then the number of dogs that you have. Stay Away from chew toys that can be easily eaten by any members of your pack. Besides being loaded with chemicals and empty calories, things like rawhides, bully sticks, and pig ears can cause coveting and guarding. 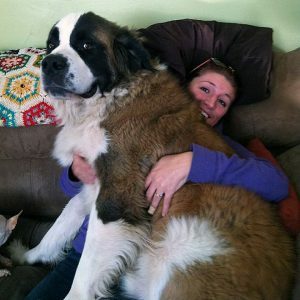 Choose Items that are designed for the largest dog(s) that you have … or bigger! 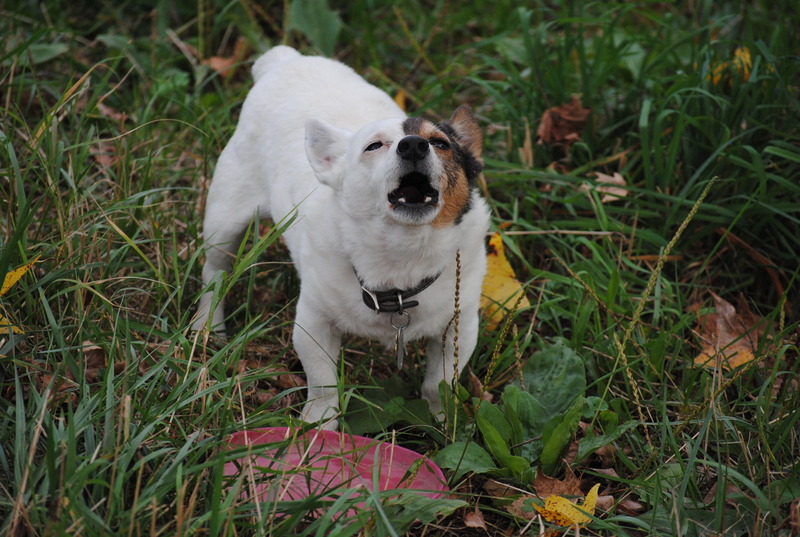 Once any toy gets small enough to cause a choking or ingesting problem for any of your dogs….. THROW it OUT! My Favorite Treat to give my pack of dogs is Antlers . I prefer Moose antlers as most manufacturers use naturally shed antlers, Moose Antlers are also the hardest of the three antlers that are commonly used. Elk Antlers are not quite as hard and can splinter, and deer antlers are the softest and most common. My dogs will grind away on an antler for hours, and my moose antlers will last for months. Nylabones are also a very good option, and in a multi dog household, a variety should be available. It is a mystery to me why, when given a toy with a squeaker in it, most dogs have to get that squeaker out ASAP.. So I stay away from stuffed toys with squeakers, but we love toys that squeak and have no stuffing. Two of my agility dogs have “special” balls that we use only for training that squeak, and for every day playing we use kong squeak air balls. Toys that are made of fabric, no stuffing, just squeakers are a favorite in my house. Plush Puppies snakes are large enough for tugging, and are fun to carry and squeak. Years ago, I ended up with two puppies in one summer, both were rescues, one a German Shepherd and the other a little beagle mix. 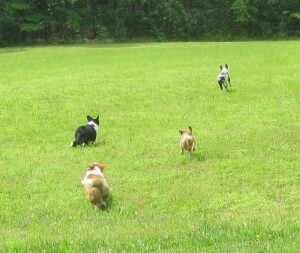 The beagle, Bandit, was a little older then the Shepherd, Bailey and for a little while they were the same size. One day, while I was peacefully managing the barn work, and they were entertaining each other, they got rather quiet in a stall. As I peeked around the corner to see what they were up to, they both stopped and looked back at me… each one hanging onto the end of a bailing twine. I took the bailing twine, added a couple more tied it into a bunch of knots, and it became our first rope tug toy . Tug Toys have come a long way , but the appeal to dogs is amazing. Fleece tug toys and tugs made with ropes come in a variety of combinations. Many in the Agility world use fleece or rope leashes that dogs can tug and pull, but in a multidog house hold a heavy duty rope tug out in the playing field can give your dogs a chance to play keep away with each other, and you can join in shake and tug and throw and let them run and have fun with a sturdy toy that will be around for a long time. Remember that all the toys ultimately belong to you. You worked hard to buy your dogs the best toys, that would last long and play hard. Train your dogs with a release word, so that when fun time is over, you can put away the toys that are “special”. With the use of a high value treat in one hand, grab hold of the toy that is in your dogs mouth and tell him “give” or ” trade” or what ever you want your release word to be. When your dog releases the toy for the treat, give him the treat and place the toy out of sight . Enjoy your dogs daily, have fun with them and remember to let them see you play! I had done obedience training with 3 or 4 dogs before I had kids.. so I kinda knew what I needed to do to live happily with dogs.. Through horses I met a little Jack Russel Terrier named “Bud”. Best darn farm dog I had met.. short and stocky with up ears and a brown patch over one eye on his otherwise all white body. When “Bud” became a dad, my husband had an opportunity to barter for a puppy.. and so “Jack” came into our household. As a puppy Jack was easily over stimulated and often wide open, and full grown at 12 pounds, totally portable.! Jack became an important part of our family and went where ever we went. Like his Dad, Jack loved to fetch and if I had a ball, I had Jacks attention. Jack quickly had me trained to throw his ball through his insistent barking. Stall cleaning, the quiet reflective chore that it is, became constant barking.. he had done it.. he barked, I threw the ball… over and over.. Finally, I realized what I had become, and that I was trained..! I knew I needed to fix this and teaching him to not bark was not happening.. I needed to teach him something else. I noticed that occasionally he would push the tennis ball with his nose, and when he did this he was not barking.. Jack quickly learned what “push it” meant, graduated to soccer balls, and went on to become a star soccer mascot for my sons soccer team, but that is another story. Jack taught me if you have a dog that is motivated, teaching is a breeze. Jacks motivation was a ball. Barking was just a small part of Jacks annoying behaviors, and living with a Jack Russel Terrier is not a task for the lazy. Jack was the smallest dog I’ve ever owned, but he had the biggest heart and garnered respect where ever he went. Never mean or aggressive, but always ready to take on the biggest foe if necessary. Jack could of been a difficult dog, but because we were an active family, and he was able to go with us, he got a lot of exercise. Exercise makes dogs happy, and happy dogs make for happy owners. No matter where you live, the size or breed of your dog(s), or the weather, there are many options for getting your dog a little physical and mental stimulation while benefiting yourself as well. There are dog clubs, breed specific clubs, and training clubs. There are dog parks and retail outlets that allow dogs. And the best thing about getting out with your dog(s) is the people that you will meet. I highly recommend starting out with a obedience lesson at a couple different facilities if possible. Meet the people, watch a class or two before you register and learn a bit about their training methods. Many times we become so compliant At home with our dogs, we don’t even realize how alone we are. If you allow your dogs to give you a reason to get out and explore new adventures, you will be amazed at the camaraderie, support and new doors that will be open for you. Remember, in a multiple dog household, try to find something that each one of your dogs enjoys, and spend a few minutes of your time daily enjoying life with your dogs using the motivation that your dog enjoys most.